What is the Sykes-Pico Agreement? . It was an agreement arranged between Mark Sykes, a British government representative and Francois Georges-Picot, a French government representative, for their respective governments to divide Arab lands into colonial protectorates during and after WWI. For any basic understanding of instability in the Arab world today, this agreement is a good starting point for discussion. This plan grew out of a British strategy to weaken the Ottoman Empire during WWI. In an "the enemy of my enemy is my friend" scenario, the British wanted to weaken the Ottoman Empire, which was allied with Germany against the British, by strengthening Muslim Arabs' desire for a caliphate emanating from Mecca in what is now Saudi Arabia. For several centuries, the Ottoman Turks had ruled over large areas of Arab lands with a Muslim caliphate of their own. Muslim, Christian and Jewish Arabs, along with other, smaller religious communities had lived under Ottoman rule. However, Arab people wanted to rule themselves. "It would be quite a stretch to propose that the British officials most closely involved in this matter had masterminded the so-called Great Arab Revolt against the Ottoman Empire , or even that they had initially supported the idea of Arab Nationalism.Arab nationalists had been entertaining the advancement of a Meccan Caliphate for a few decades prior to the outset of the Great War. (p. 135)"
"The allies had thus used the holy city (Mecca) only as a neutralizing device upon Ottoman efforts to stir Islamic sentiment. In short, the Sherif of Mecca and his Arab nationalists had been duped and, to this day, the Arab world would be reminded of it at every crossing of a border checkpoint from Lebanon to Syria, Iraq to Jordan, Jordan to Israel and so on, and perhaps most vividly in making the Hajj and crossing into Saudi Arabia. (p. 135)"
Arab citizens in the areas coveted by the British and French were, prior to the creation of enforced borders, able to travel between the regional metropolises of Jerusalem, Damascus, Cairo, Beirut, Mecca and Baghdad without major limitations. In fact, there are traditional trade routes that have existed for hundreds if not thousands of years. 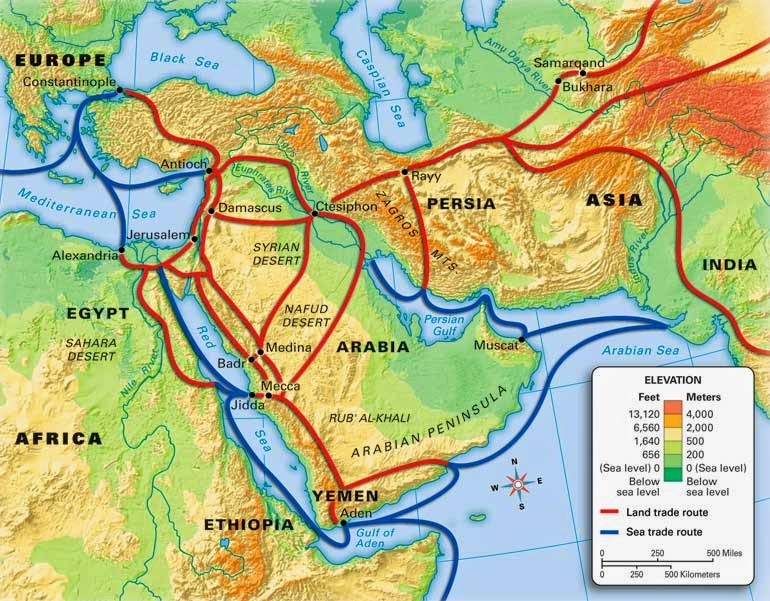 Via Maris and Kings Highway trade routes circa 1300. 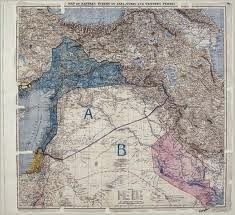 The Sykes-Picot agreement drew artificial boundaries among populations that had moved reasonably freely for centuries. Due to the interference of colonial powers and weak Arab leadership, the Arab world has continued to grapple with how to form concepts of national citizenship while competing with neighbors who speak the same language and share the same history and culture. This situation has been destabilizing on the local populations because the Arab leadership that grew out of the British – French involvement in the Arab world was not meant to be democratic, but despotic, to keep control over the nations' wealth. The Arab world continues to provide historically colonial powers, the British, French and now Israel and the United States, with wealth and resources that rightly belong to the Arab people of the region. As it is now, there is little investment in quality education and industry in most areas of the Arab world. Instead the wealth stays in the hands of Arab rulers or flows outward to the rest of the world. But, back to the assignment I mentioned earlier. After my first use of this assignment in a course in 2008, I had one student, a U.S. army veteran who had been deployed to Iraq and who had spent time in Kuwait, say that he wished he had received the assignment in high school. Would he have still joined the military with the potential to serve in Iraq? I asked. His answer was ultimately yes, because he joined the military for a multitude of reasons, but he would have been much more knowledgeable about the situation he was entering. He thought he might have been able to contribute more nuance to certain situations when working with the local Iraqi population. However, the class as a whole agreed that if a more complex history of the Middle East were offered in high school, we might have engaged Iraq through different means and methods because ultimately, any long-term solution for stability has to take the culture and history of the region into account. As citizens, we need to understand the scope of situations that our nation faces. Middle East, Wilder is working to educate others with the eventual goal of peaceful solutions to the current instability in the Middle East. 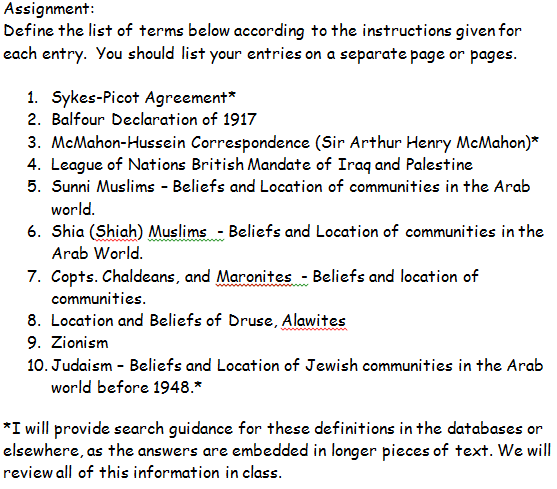 As is evident by the information above, much context on situations in the Arab world can be gained just by completing a definition of the Sykes-Picot Agreement, but there are nine other terms on the list. Students also learn about other agreements colonial powers negotiated on behalf of the Arab world and those that were arranged with the consultation of weak Arab leaders. By the time one of my students completes the list of ten most important terms, they have learned of many nuances and have usually created an additional list of terms. But I can't let those who design education in the Arab world off of the hook. So many of today's problems stem from a lack of opportunity offered to young people. There is an uneven mechanism of education and training which produce no meaningful outcomes for millions of young Arab men and women. Despotic leadership coupled with lack of opportunity to prosper and productively use their intelligence is motivating many young men to look back to a rose-colored ideal of the Muslim caliphate. When one feels unstable, hopeless even, the security of Sharia law with its definite rules and punishments is more willingly embraced. The psychic rewards of feeling as though one's beliefs have an answer for the ills of the world can be intoxicating. The best way to avoid instability is to offer young people a path to gain prosperity through education where they can apply their intellect and skill to the intellectual and practical needs of society. To paraphrase the poet, Maya Angelou, "when we know better we do better." Let's find ways to make global history and culture more meaningful to young people in all countries. Let's help the younger generation create new routes to prosperity and stability so that they can can make more informed choices than we have made so far. Samman, Khaldoun (2007). Cities of god and nationalism: Mecca, jerusalem and rome as contested world cities. Paradigm Publishers: London.